After many years of shooting digital stereo using Canon point & shoot cameras equipped with SDM software, I have finally upgraded to a better quality stereo rig, that promises to bring back the look and feel of an RBT custom stereo film camera. These cameras are linked using a mount that attaches to the lens mounting rings on the front of the Samsung NX1000 mirrorless cameras. This mount is made by Werner Bloos and is for sale in North America from George Themelis. Details about purchase and use of this mount is available here. This rig does not have any special software required to synchronize the cameras. 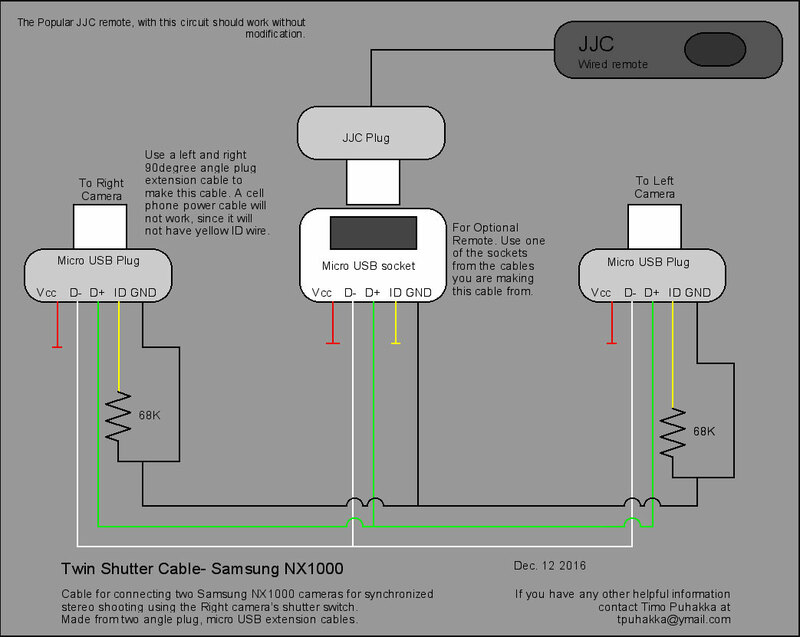 A fairly simple cable, connected to the USB port of each camera allows both camera shutters to be fired by pressing the shutter release on one camera. Synchronization is pretty good but not as good as an SDM rig or a pair of Canon DSLRs.Synchronization is turning out to be better than my SDM epuipped cameras. Here is a typical example of the images possible with this rig. I have stopped even thinking about how good the synchronization will be. A wired remote shutter release is attached to the synch cable and is always present (clipped to the neck strap) for tripod shots. 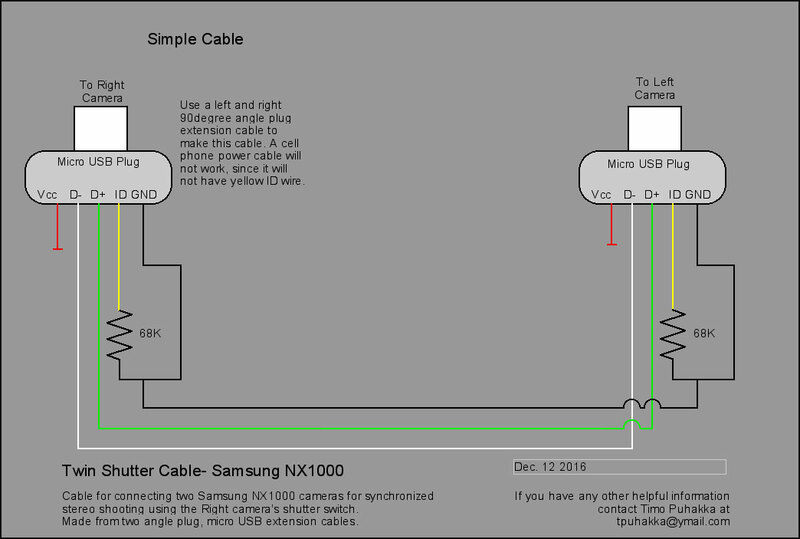 Schematics for these cables are provided below. The brass linkage lets the zooms be adjusted simultaneously. A brass bar with a loop at the top also allows the neck strap to be connected at the top of the Left camera. A grip has been added to the Right camera to make it easier to hold the camera rig in the right hand while adjusting the zoom with the left hand. The plate which holds this grip has a channel machined into the underside to contain the sych cable. On the bottom there is a quick release tripod adapter permanently fastened. Using the AE Bracket function you can set the bracket order and the range as far as +/- 3EV. This allows making HDR stereo images. Changing between single frame and bracket is fairly quick and easy. Synchronization is usually good enough for flash photography (using a conventional "dumb" flash, not the Samsung smart flash, which destroys synchronization), however a fair percentage of flash shots on my rig will result in the left camera showing a partially open shutter. I have now installed a Magic Flash made by Rob Crockett of Ledametrix which solves all my flash problems. I am not sure he has anymore of these for sale but it is worth a try asking him. Acording to George Themelis, most cameras should be able to synchronize flash even without a Magic Flash. You may have to swap cameras to make sure the slower camera is set as the left camera. I my case, I have a slightly faulty right camera. For me the Magic Flash solves multiple flash problems. The wiring is fairly simple and is detailed in the schematics below. I have worked out the wire colours and the pinouts for you. I made my cable from a Left hand and a Right hand micro USB extension cable. You can not use a cell phone power cable since they usually don't have the ID wire (the yellow one). Updated 12 Dec 2016. Some people have noticed that the Jpeg files produced by default in the Samsung NX1000 are a bit flat. This is better if you set the camera to "Vivid" using the "Picture Wizard". It turns out you can adjust this setting to either make the vivid setting more vivid, or you can set up three completely custom settings. When setting the Picture Wizard you will find three custom settings. When you select one, press the "Disp" button on the ring control and a screen with individual settings will appear. This lets you control the colour balance, saturation, sharpness. and contrast. After setting these to your preference, you press "set" and it will be remembered for future use. This feature is in the user manual but is not detailed and is easily missed. 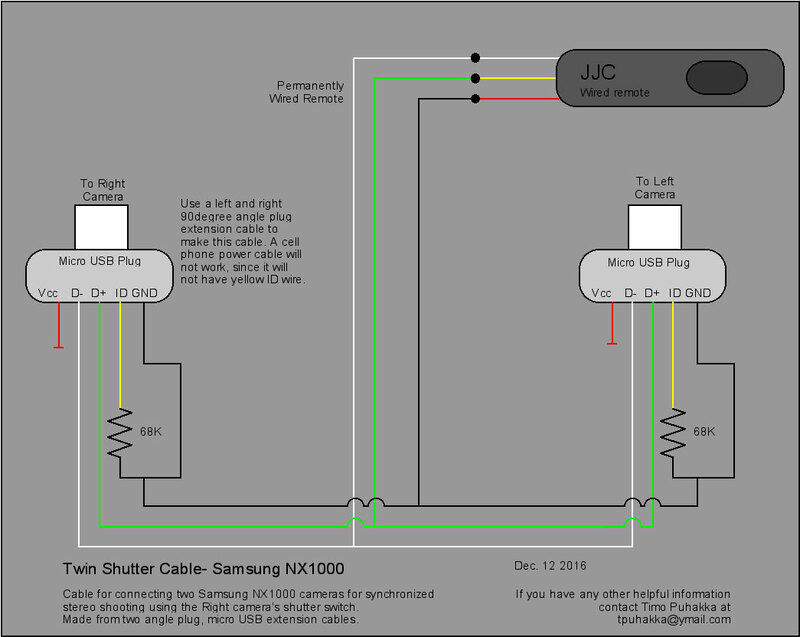 A common problem with Samsung NX1000 cameras (and apparently other Samsung cameras) is with the Mode dial. The effect is that the camera mode will jump around while you are trying to set a different mode. This can range from a mild inconvenience to a major one, when the camera refuses to settle into the chosen mode, or if it just continues to jump around when you aren't even touching the dial. There are three suggestions I found on the internet. The simplest, blowing canned air into the dial, I tried first. No change. The second suggestion, pouring alcohol into the dial and turning it to clean it, was the next one to try. I upgraded the suggestion and used contact cleaner (both these methods require removing the batteries first). I can't tell you which contact cleaner I used, since my can is a relabeled can from the now defunct "Active Surplus". I sprayed a little contact cleaner under the dial as best I could and turned the dial in both directions for a few seconds. After letting the cameras dry for a few minutes, I reloaded the batteries and was pleasantly surprised that it seems to have worked for both cameras. Only a couple of tests as of Jan 16th 2017, but so far so good. Update: my cameras have started to jump again so what about the lubricant? Ray Moxom has discovered a product called CRC 2-26 which is an electrical cleaner a lubricant. It is plastic safe and prevents problems with dry switch contacts. He and George Themelis have found this to work. I have found a similar product availiable in Canada which is also working as of April 11th 2017.